We all have our reasons for defriending on Facebook. It could be oversharing, offensive comments, incompatible political views and a host of other reasons. Similarly, we add friends becausewe know them in real life, we're looking to expand our business contacts, or maybe we just think they look good. 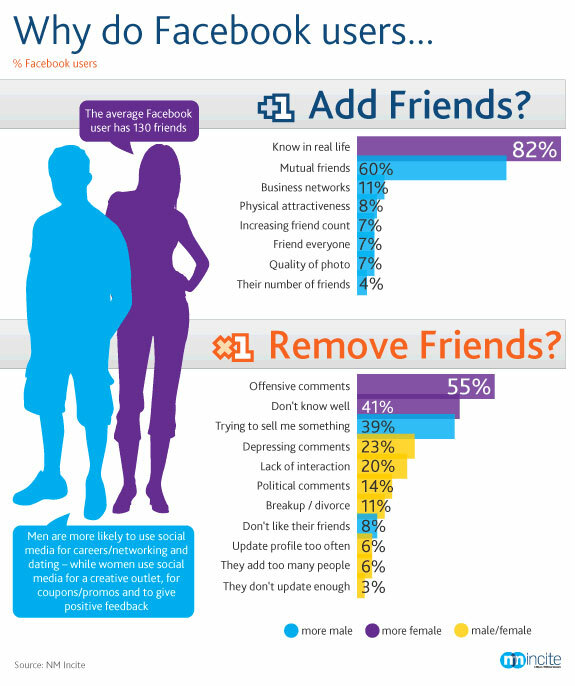 In research conducted by Nielsen, Facebooker's polled list their top reasons for adding and removing friends. Unsurprisingly, 82% indicated the primary reason for adding friends is that they're acquainted with them in real life, while 55% of those polled said offensive remarks were the biggest cause for defriending. More interesting is that 8% (predominantly men), give physical attractiveness as a reason to friend someone. 39% said that getting a sales pitch from a friend was reason to remove them, with 23% reporting that "depressing comments" warranted defriending. Check out the details of the survey here, and let us know why you've added or subtracted pals on Facebook. I unfriend an old boyfriend who found me on facebook. when he started acting the same way that led to the breakup, i lowered the ‘BOOM’. He couldn’t understand why he could no longer see my page. I suggested he may have be doing something wrong. When someone puts too many links to follow and not enough of themselves I do get bored. When someone is there everyday telling every move they make….. i.e. Just left Starbuck or off to the gym or on an on details. Or when they are negative all the time. I personally like real life. I share mine and what others to share theirs. How can I reach out and help someone with a comment or congratulate them on something? I love Facebook for these reasons…. not to just dump my opinion on others. Though I do participate in that at times. I enter a lot of giveaways and some of them require following on facebook . Unfortunately facebook only allows 5000 friends/likes so I’ve reached the max. Facebook REALLY needs to have a way for us to more easily decide WHO to unfollow - like when did we start following these people, or who is no longer active on facebook. I hope you enter all of our giveaways! How often do you win? I unfriended a couple of people because they kept putting out there opinions (ad nauseum) about sports - don’t get me wrong, I like sports (GO CARDS!!) but when people keep hating on players, etc., and making dumb comments, I just can’t take it . I have unfriended several friends on FB because I was not interested in what they were saying, what they were doing or going to do, or had done. I just could not relate. I have unfriended people who constantly act like “woah is me”. I also unfriended neighbors who were to interested in my life and started blabbing about me in our neighborhood. I do love Facebook for catching up with people who I probably will never see again or have no intention on catching up “in person”. Yes a Jihadist. Sorry but he went all weird on me when he discovered I was a Christian so I unfriended him and changed my lite security status to “Castle and Stone walls” Other than that have not unfriended anyone and haven’t been unfriended. I don’t spend a tremendous amount of time in social sites except in the dead of winter when the snow is too high to dig out of my mountain road. Since my work is computer home office work it gets pretty cabin feverish come winter. Facebook throws of the dull drums. I unfriended a few because of offensive behavior, the swearing, crude comments, and hateful political statements. Another “unfriended” me because I got tired of her “pity” parties and dared to say something about it. What galls me is she brought a lot of her problems down on herself. She refused to look for work and ran up massive debts. She even lied to the IRS and claimed her youngest daughter a depended when she’s not. Then when it all was about ready to “crash” down on her, she conveniently “checked” herself in to the “psyche” ward. She knew in doing this, this would let her off the hook and everybody would feel sorry for her. All she did was manipulate and con people. Frankly, I’m glad she is no longer on my FB. Her “unfriending” me did me a HUGE favor! i unfriended a guy who i obviously knew in HS. he knew everything and was also friends with my remembered HS friends. That being 25 years ago (ouch) i have forgotten some people…he was one. At first it didnt bother me, but then he started PMing me A LOT and asking to come visit me to meet my hubby and new baby…so i unfriended. i felt bad…but oh well. I found out that I was unfriended on facebook from a person after we had a personal disagreement. I see her often and we do not speak. It doesn’t bother me at all because she was trying to take advantage of my being a stay at home mom and only became my friend so that I can pick her daughter up from school. Was just unfriended by a Farm-ville person. Thank God. I joined Farm-ville to check it out and was bored to tears and it actually bothered me the thing still ran in the background and you can’t turn it off. Being an FPS RPG gamer naturally Farm-ville was boring. This one woman when I would not respond to her Farm-ville gifts started sending pics with her back turned to me. I had quit Farm-ville and she was apparently upset. Glad to be rid of the weirdities.